Long Beach School of Music is located next to Heartwell Park and Golf Course, off of Carson Street, off of the 605 San Gabriel Freeway. Even for someone with no prior musical experience our easy to follow instruction makes learning uncomplicated and fun – pretty much effortless. Every instructor at Long Beach School of Music is committed to finding the approach that works best for each person, and is patient and encouraging. Students can work at their own pace so they never have to feel stressed out. Pick the style of music and songs you want to play. We offer programs in classical, jazz, blues rock & pop styles. Awesome! That’s the usual answer. Imagine the amazed look on your friends and family’s faces if you picked up your instrument right this instant and started playing yours and everyone’s favorite songs with no effort whatsoever. Alternate lesson times are sometimes available depending on individual instructor schedules. Call us with your specific time requests. "I really enjoy my lessons each week and my instructor always knows how to adapt to my interests...keeps me motivated to keep playing!" "The lessons have helped me get into playing after so many years. It has also me to understand further in detail how things are put together." "We have had a wonderful experience with your method of instruction." "Everyone is very friendly, patient and interested in MUSIC! Jenny doesn't feel pressured. She wants to enjoy taking lessons and she does. It's relaxed and fun. Thank you for your great school!" Long Beach School of Music is minutes away from the 405 and 605 freeways, right next to Heartwell Park, less than half a mile from the Long Beach Town Centre. Centrally located in the middle of Long Beach's Bixby Knolls, El Dorado Park Estates, and College Park Estates neighborhoods; convenient for residents of Lakewood, Cerritos, Cypress, Los Alamitos and Rossmoor. One out of four students is an adult studying music for personal enrichment. We have a higher percentage of adult students than any other music school or independent teaching studio. Our students come from the following cities: Long Beach, Bellflower, Cerritos, Lakewood, Compton, Carson, South Gate, Whittier, Cypress, La Palma, Los Alamitos, Rossmoor, Seal Beach, and Huntington Beach. Why Choose Long Beach School of Music? Our music schools are run with the philosophy that all students are not alike and should be educated in the way that is most helpful to the student; that group or classroom instruction is not as individualized as most students need in order for them to achieve the greatest success; and finally, that all instruction should be on a one-on-one basis so as to fully focus on a students specific needs and interests. There will be instructors available (in person or by phone) if students need extra help on their assignments. Recitals with a live band for guitar, drum, keyboard and bass students. We've put together professional bands,and presented programs of student performances on a Sunday afternoon. 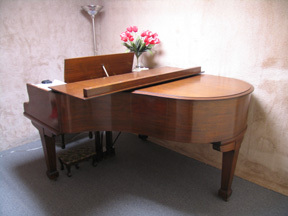 For information about the school's classical piano and jazz piano program click on piano lessons. Long Beach School of Music instructors perform small informal concerts for current students. Various Guest Artists teach master classes in classical piano, jazz piano, and jazz ensemble performance. Jam sessions are opportunities to get together with other student musicians and teachers and play. All students are welcome to come and listen. The school has been supplying guitar and bass students with the necessary material for a low fee so there is usually no need to buy extra books. We help choose the right lesson material that is appropriate for each individual. Yes you can. Beginning guitar at least is not advanced rocket science, and yes most of you could teach yourself a bunch of chords, learn some basic songs and learn to read tablature to pick up some cool riffs to impress your friends. All you've got to do is wade through the hundreds of thousands of free lesson, tab and video sites available. In fact if that's all you want to do great, mission accomplished, and at no cost to you. Don't read any further. This article is aimed at the persons that want to become good at the guitar. The big issue is that so much information in "web land" is presented by total beginners, who in reality, are not qualified and could never actually get a job teaching in a real music studio. That's not to say that there's not some really great lessons expertly presented. However, this leads to a major problem. How do you know what to follow? The short answer is you don't. To me, as a professional guitar coach who has been at it many years before the internet, I find most of the information my students download and bring to lesson totally laughable. 99% of the time it is so bad that I just tell them to not bother bringing it in anymore. I tell students is that if you like a certain artist buy their tab book, and I will help them through it. The same goes for YouTube lessons. The argument against online guitar education applies to books and CD/DVD methods as well. The difference is that the information is more than likely presented by a knowledgeable expert. 3 Having the discipline on your own to keep up the follow through. For many this very frustrating and a lot of potential players give up and blame themselves. Just trust me on this, most of the time it's not you. OK that's really easy. Quit your job, camp on various friend's sofas, starve, play guitar 16 hours a day, starve some more. Do that for a few years and you'll probably get really good. Next! Seriously most people starting out aren't able to put so much much time into so lessons are a shortcut. A good instructor can offer insights that he or she has gathered over the years. The biggest advantage of having an instructor in front of you is that when your frustration is at a high point and everything sounds bad, it's really useful to have someone tell you "It's ok, it should sound like that at this point, and in fact you are doing everything right," or,” here are a couple of corrections so just keep practicing and it will work." The teacher also has the ability try multiple approaches that online lessons, method books, CDs and DVDs cannot. Online, how do you know if the information is correct? Online, you don't always know if you are doing things right. An instructor can modify their approach to your learning style. An Instructor can be asked questions. An instructor can demonstrate many ways. So while I think it's fun and challenging to teach yourself and by all means go ahead and keep doing it, but do yourself a favor and check in with a good teacher once in a while, if not on a regular basis to keep you on track. For the last several years our instructors have had many opportunities to work with special needs children, especially those with autism spectrum disorder. This customized approach to teaching fits the special needs students since no one program or approach will benefit all students, special needs or not. One-on-one music lessons in a regular music school environment are an opportunity for these students to participate in a mainstream activity without the distraction of other students in the room. Every instructor is committed to finding the approach that works best for each person, and is patient and encouraging. Students can work at their own pace so they never have to feel stressed out. Pick the style of music and songs you want to play. Whether it’s songs from the Rock Band and Guitar Hero video games, classical, jazz, blues – you name it, we’ll teach it. For parents that want their children to do more than sit around watching TV or playing video games, music lessons may be the answer. It's not just about music lessons. It's about developing life skills. Parents who enroll their kids in music lessons are encouraging their children to get involved in a productive, educational activity which is culturally enriching, and which develops the brain, intellect, motor skills, self-esteem and discipline. Education, development of work habits and discipline. Getting the child away from the TV, video games, and hanging out at the mall. Beyond the basics, many musicians feel that they aren't progressing fast enough in their knowledge and playing abilities; or that what they've learned seems scattered and unrelated. Blues, rock and jazz improvisation; performance skills, and practical music theory are all taught. Topics include improvisational techniques, scales beyond the basic major and minor, phrasing, chord progressions, progressive scale techniques, arpeggios, intervals, advanced chord construction, rhythm, scale and chord theory, definitions, transposition and musical styles. We believe that the majority of students get more out of their music lessons and progress at a much faster rate if they can learn the styles of music that they love. Every student is taught the same fundamentals in regards to music theory and technique. The only difference is, is that one person may be taught their "do re mi's" with their favorite rock band while another may learn the same basic theory, but with traditional classical repertoire.. Here is a list of our music teachers and instruments taught. The location for each teacher is subject to change, per the teacher's schedule. Click on the instrument you are interested in to see the instructors. All lessons are one-on-one. Long Beach location only - Electric Guitar, Acoustic Guitar, Songwriting, Composition and Improvisation Lessons. Jazz, Rock, Blues guitar. Blues, Jazz, Rock, Country. Band Leader, Black Plate Kings (blues band). Redondo Beachlocation only - All levels, classical through jazz. Soprano, Tenor and Alto Saxophone, Flute, Clarinet, Improvisation. Jazz, Blues, Rock, Funk. Certificate of Merit exams. Long Beach - Intermediate through advanced classical piano lessons, Music Teachers' Association of California-Long Beach Branch, Certificate of Merit, Southern California Junior Bach Festival (SCJBF), Southwestern Youth Music Festival (SYMF), Sonata / Sonatina Festival, Long Beach Mozart Festival. Also teaches Piano Performance Boot Camp, monthly piano performance classes, workshops and master classes. Redondo Beach & Long Beach - Beginning-intermediate Piano Lessons, Music Teachers' Association of California-Long Beach Branch, Certificate of Merit, National Piano Teachers' Guild-American College of Musicians. Jazz, pop style piano, chord chart reading and improvisation. At our music schools, we are dedicated to providing our students with the best possible learning environment. Our highly knowledgeable teachers are committed to finding the approach that works best for each individual. Our instructors include university graduates, as well as working professionals with many years of performing, recording and teaching experience. Tuition for the month is paid in full at the beginning of each month. All legitimate cancellations will taken as make-ups only and not credited to the following month's tuition. Note: Some instructor's rates may be higher depending on their specialties. 1) "How much do I have to practice?" Many are under the impression that hours upon hours per week are needed to get good at playing the guitar. Unless you are planning on being a guitar superstar in the first few weeks, this is simply not true. If you can find 20 minutes to an hour a day, four or five days out of the week, you will noticeably progress. Generally, students find the more they accomplish, the more they are encouraged to practice. 2) "What if I have no musical talent?" Some worry about being "tone deaf" or that they have "no rhythm." Something we truly believe is that everyone has some sort of innate musical talent. Initially, some may appear to have it more obviously than others, but there are many instances when a student who seemed to be not getting it at first became the one that surpassed the rest. 3) "What if I don't have a guitar?" Guitars can be purchased relatively inexpensively. For under $300 one can get a decent acoustic guitar, or an electric guitar and a small amplifier. Used instruments can even be less. 4) "What if I don't know how to read music?" We can teach you, and our instructors will make it an enjoyable learning process. However, since most of what guitar does in popular styles is rhythm accompaniment, beginning guitar is usually is taught through a variety of other methods that make more sense to that style. As a student progresses beyond the beginning stages they will find that reading music is useful for more advanced musical understanding. Students are encouraged to make reading a part of their learning experience. 5) "What if I've never played a musical instrument before?" Learning a musical instrument does not require any background. Ultimately every musician has started from zero. All that is necessary is the desire, and a willingness to practice. 6) "What if my hands or fingers are too big or too small?" It is extremely rare that this ever true. Once a student realizes what needs to be stretched and how to work on this then they find that it's not as difficult as they imagined. Having a qualified instructor look at the individual is recommended. 7) "Why can't I teach myself?" then the various instructional materials available are much easier to deal with. 8) "How long will I have to take lessons before I can play anything?" Although this is a tricky question to answer because every student is different, the average is between two to four weeks before a student can start playing some simpler songs. 9) "How long to I have to keep taking lessons?" Our goal is to make the student self-sufficient so that after they learn the basics they can teach themselves. This could happen after just a few lessons. One doesn't necessarily need to keep taking lessons to learn enough to become a competent player. However, once a student gets involved in the guitar they often find that they enjoy the learning process so much that they want to keep it up and study techniques beyond the basic chordal accompaniment styles. 10) "Can you learn anything in a group class?" Yes, group classes can be useful as an introduction to playing an instrument. The problem is that everyone learns differently. This makes it difficult for an instructor to address each student's individual concerns as most group classes tend to be short and have a large number of students. Click here for Long Beach and South Bay Student Honor Roll, State Convention, Branch Honors Recital lists. What is Certificate of Merit? Click here for more information about the Certificate of Merit program. Click here for Long Beach and Redondo Beach National Piano Guild Five Year Winners and for general National Piano Guild results. What is National Piano Guild? Click here for more information about the National Piano Guild Program. Long Beach Guitar School is located in Suite 111 of the Long Beach School of Music. 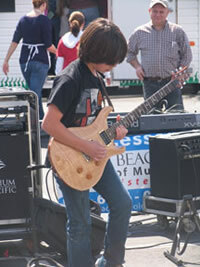 Find out more about Long Beach Guitar School's exceptional program of guitar, bass and drum lessons. What Kind of Music Motivates You? Long Beach School of Music students, teachers and staff care about the communities in which we live. ...Performing at the Lakewood Mall to raise money for the Music Teachers' Association of California Long Beach Branch Piano Fund. Click here to find out what else we are doing! Guitar School and South Bay School of Music serve the South Bay area including Palos Verdes, Rolling Hills Estates, Rancho Palos Verdes, Palos Verdes Estates, Torrance, Hermosa Beach, Manhattan Beach, Redondo Beach, Lomita, El Segundo, Hawthorne, Lawndale, San Pedro, Wilmington, Harbor City, Gardena, Hawthorne and Carson. We teach the songs and the styles of music that you want to learn. from our various recitals, that there is a wide range of styles & artists covered.